Crushing Machine - Jachen Technology Co., Ltd. This series is to grind items into scraps or flakes. e.g. CD, syringes, PE pipes, PP flats, PET bottles, electronic wastes, IC trays, PCB and so on. It's suitable for plastic industry & electronic product industry & medical-waste recycling industry. Also, this series is with SOUNDPROOF function to avoid noise. Blades replacement, cleaning machine, and change screen quickly. 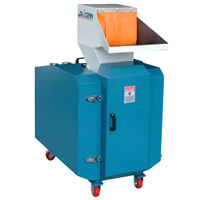 It can depends on different screen (From Φ1-20mm) to control the size of crushing granules. When screen base and hopper are being opened, the safety switch built-in the machine stops operating machine immediately. The unloading hopper is mobile and due to comprehensive employment such as auto loaders, storage barrel and bag etc., to exchange the necessary attachment. The Styrofoam inside of double layers hopper can reduce noises. All machine housing are manufactured in a horizontal or diagonally divided robust steel weld housing. Blade material is made by Japan Hitachi. Casting Cutting chamber is durable, hard engineer construction. We can depend on client` s requirements to make different specifications for machine. The design has contained vision aesthetic appearance to improve the valuable for machine.